When ons learned from the major combat operations phase of operation Iraqi Freedom were briefed to the nation’s top leaders, the question was asked:“How did events leading to the fall of Saddam Hussein’s regime look from the Iraqi perspective?” That question was posed to the Joint advanced Warfighting Program at the Institute for defense analyses (IDA), triggering the Iraqi Perspectives Project (IPP), a research effort sponsored by the U.S. Joint Forces command that has delivered several volumes of analysis and supporting materials, with more in production. The IPP is reminiscent of an effort begun in 1946, when a team of U.S. army historians and intelligence officers established a relationship with former members of the German general staff to develop an understanding of familiar events from an unfamiliar point of view. 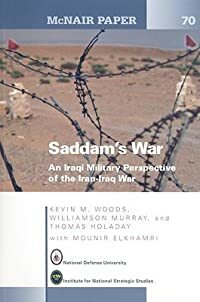 This volume marks the extension of that same methodology under a different sponsor, the National Intelligence Council, to encompass a broader spectrum of Middle Eastern military history from the perspective of Lieutenant General Ra’ad Hamdani, who during operation Iraqi Freedom commanded Saddam Hussein’s II Republican Guard Corps. Interviewed over a number of days by project leader Kevin Woods and historian Williamson “Wick” Murray, General Hamdani shared his knowledge about a wide range of subjects, with particular emphasis on his experiences in Iraq’s long war against Iran. The project’s objective was to produce a series of personal, organizational, and campaign histories of contemporary Iraq. This volume is the first in that series, provided with the hope that it will improve our understanding of Middle Eastern military thought, the new Iraqi military, neighboring countries, and the dynamics of a region of the world that is vital to U.S. interests. Topics of the discussions themselves ranged from the immediate tactical outcomes of particular actions in the Iran-Iraq War, to the interplay between the requirements of tyrannies (religious as well as secular) to control their political future, to the demands of military organizations for professionally competent officers who understand tactics and operations and who are able and willing to provide honest judgments of what is happening or might happen on the battlefield. In that respect, Ayatollah Rhollah Khomeini’s Iran and Saddam’s Iraq exhibited considerable similarities, although Saddam at times proved a faster learner—at least over the course of his war against Iran. On the opposite side, Khomeini and his fellow religious leaders appear to have clung, right through to the conflict’s end, to their belief that religious fanaticism and revolutionary spirit would triumph over all.